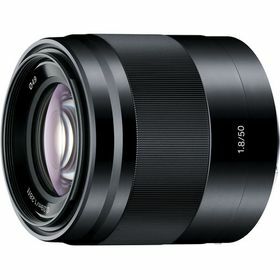 The black Sony E 50mm f/1.8 OSS Lens is a prime portrait-length lens featuring a bright f/1.8 maximum aperture and a 35mm-equivalent focal length of 75mm. The lens has a lightweight and compact design with an aluminum alloy lens barrel and engraved focusing ring to provide greater handling as well as an aesthetic appearance. Greatly benefitting handheld usage with this lens is Optical SteadyShot image stabilisation, which works to minimise the appearance of camera shake by up to four shutter speed steps to support use in low-light conditions. Optical SteadyShot image stabilisation works to minimise the appearance of camera shake by up to four shutter speed steps to benefit shooting handheld in dim lighting and with greater zoom magnifications.